The good thing about going to a restaurant with the family is that I get to try a lot of different things. 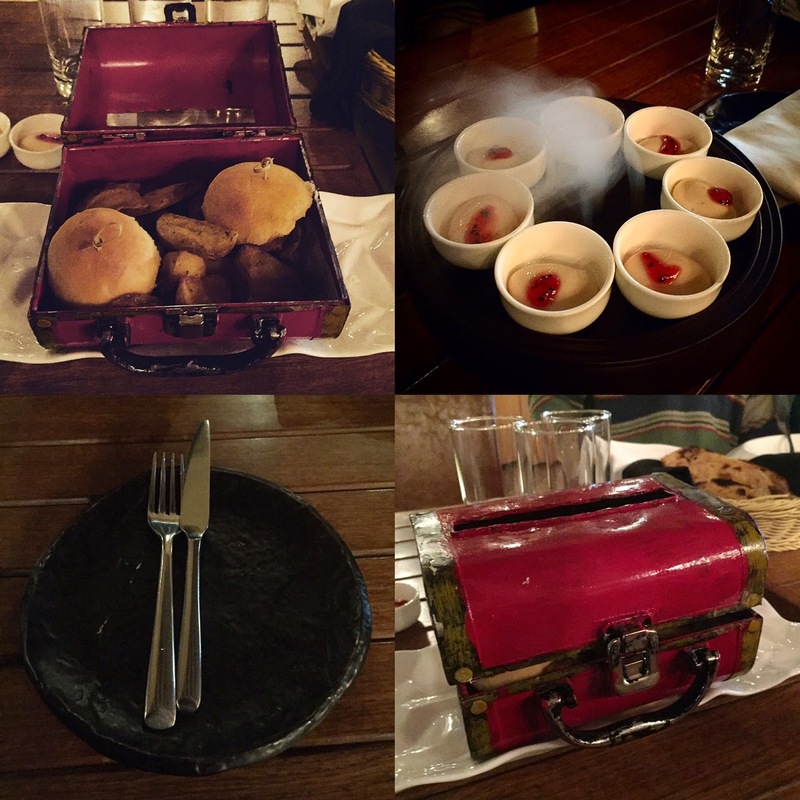 As this was the case with Farzi Café, the much talked about place at Cyber Hub, Gurgaon, I was able to sample across their menu and got a pretty good idea of what they offer. Sunday afternoon can be quite hectic at Cyber Hub and even at 1:00 PM, which is just about the start of the lunch hour, Farzi Café already had a 45 minute wait time. Luckily for us, we got called in after waiting for about only 15 minutes. Why Farzi? That question lingers in my mind still. I could have asked the management but didn’t. All I can conjure up is that the food isn’t supposed to look like what it is, thus Farzi (fake). Unfortunately, my only complaint about the whole place is because of this; that is, I couldn’t see the food let alone know what is was supposed to look like to actually comment on the play of words they are going for. Yes, the lighting at Farzi Café is a huge problem. Dim lights, very dark ambience, black side plates on the tables, it just seemed weird. I’m not a fan of their layout either and maybe it works well for evenings when the performance stage is in use, live music playing, no kids, and I assume the bar in full use, but at lunch it was a disappointment. The good news however is, this is all I have to complain about. To start with, the service was perfect. The staff was courteous, knowledgeable, friendly, and while the place was full and we did have to call on them a couple of times before they attended, it didn’t matter. It was service with a smile from the beginning till the very end. Now, I’d heard of and read about Farzi Café a lot, and everyone seems to mention their unique presentation style. While this is no fault of theirs, as a result of all the talk I was expecting something truly out of this world, and while Farzi does have a very unique style of presenting some of its dishes, and that shows initiative and passion for the culinary and presentation arts, it wasn’t all that I had going in my mind; think Heston Blumenthal and his flair for the culinary theatrics. 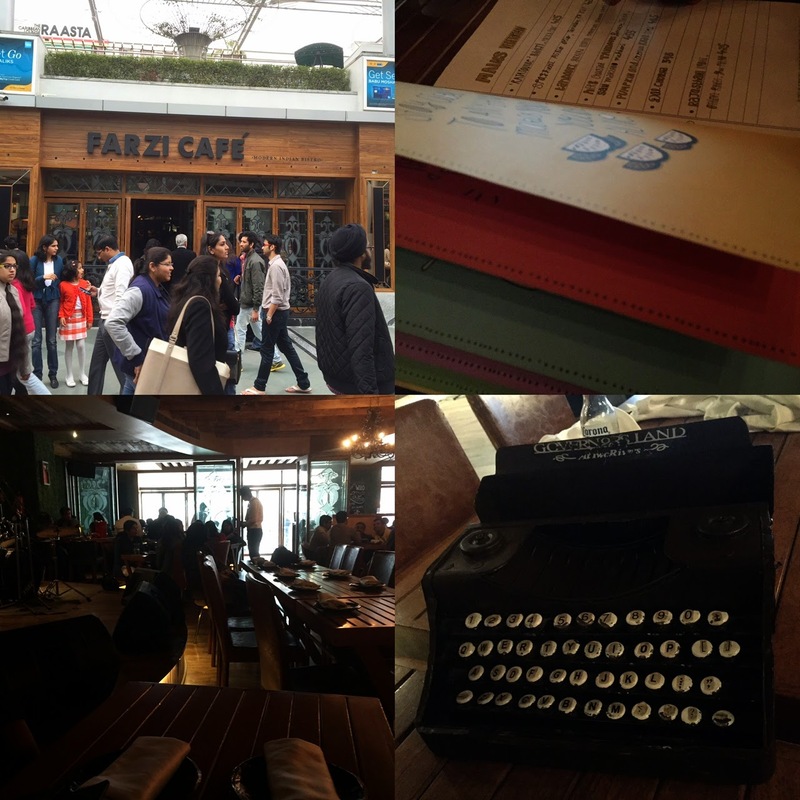 It’s different, and Farzi tries to be inventive and everything is “zara hatke”, so yes there is no doubt that the experience, if we can call it that, was worth it at the end. The act at Farzi begins with on-the-house Mishti Dohi shots. Great presentation and a lovely idea to top it with strawberry syrup; perfectly sweetened, this pre-appetizer was a great start. One thing is for sure, this certainly beats the generic Papad or the breads that are usually served at other restaurants. As for drinks, like most places these days, because we were in a group of 5 adults we ordered the Carona HI5 (5 Bottles) at around Rs. 1100,- which is a great deal. Our food varied since everyone in our house has different tastes. I was the only non-vegetarian and went for the Galouti Burger. Heavenly I tell you. The Kabab in the burger was juicy, cooked just right, melting in my mouth. Presented in a “box”, which my daughter found fascinating till the point, she realized it cannot be taken home, along with thick chips (that’s the way it should be), the burger has gone in my all time favorite food list. The same could be said about the Gupta Burger, the vegetarian equivalent of the Galouti Burger. Similar presentation, the two medium sized burgers were a delight. Next up, I managed to take a few bites of the Tandoori Guchchi Risotto which was smooth, perfectly spiced, and once again much loved. The idea of mixing tandoori with Italian showed a bit of genius. A similar kind of appreciation went for the Tandoori Paneer Tikka with Lachcha Parantha. The gravy that was poured, at the table, on the paneer tikka, was delicious, smooth, having the right thickness, and colour and would give any paneer dish around the world a run for its money. My daughter, the pizza and pasta eater, went for the Spaghetti Aglio Olio, Tamatar Ka Kut which had a unique taste due to the coconut shavings on it. Unfortunately, the spaghetti and later on the Vada Pav turned out to be extremely spicy, so much so that I had to let the staff know, which almost never happens. But, here is where Farzi scored big points with me. Without any excuses or explanations, seeing that the Spaghetti was for my daughter, they went ahead and whipped up an extra new plate, non-spicy, on the house. We managed to consume the Vada Pav, which was an appetizer, but the idea of making it as a Bonda (Big Ball) didn’t go down well and it was the least favourite of all that we had that day. I’m glad that restaurants are taking steps to be different and present their paying customers with something they will remember, cherish and talk about much after they have left the place. I had heard a lot of bad things about quantities served at Farzi Café, but my entire family was quite satisfied with the amount we were served. 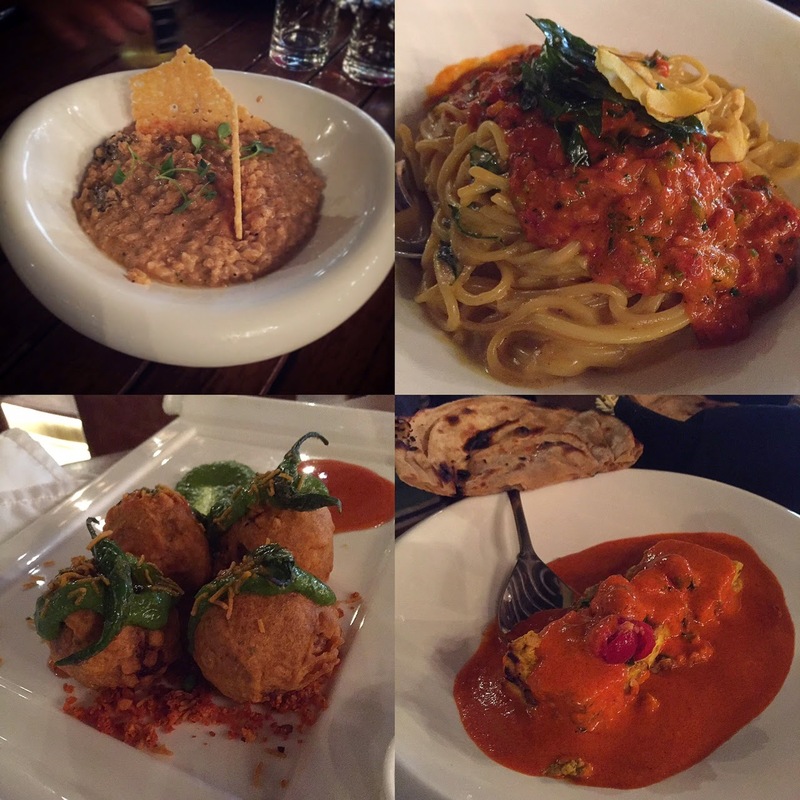 Farzi has a lot to offer and although I’m no fan of their interiors, it’s something that can be easily overlooked because the food they present is worth a try, in fact it’s worth a few visits. Moreover we did skip their desserts for two reasons; firstly their much talked about Firni at Rs 500,- plus seemed astronomically expensive especially since my Dad makes a to-die-for Firni at home and secondly right across from the restaurant is King’s Kulfi and they serve an assortment of tasty Kulfi in some rather exotic flavours. But, someday in the future, if not the Firni, I shall try something else at Farzi. The damage at Farzi was Rs. 5000,- including drinks and food for 5 adults and that’s as good as it gets these days keeping in mind all the taxes etc.